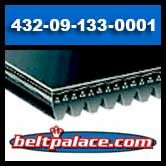 Replaces Delta 432-09-133-0001 Drive Belt (Porter Cable 432091330001). *Now obsolete from Delta. In stock. Order now while supplies last!